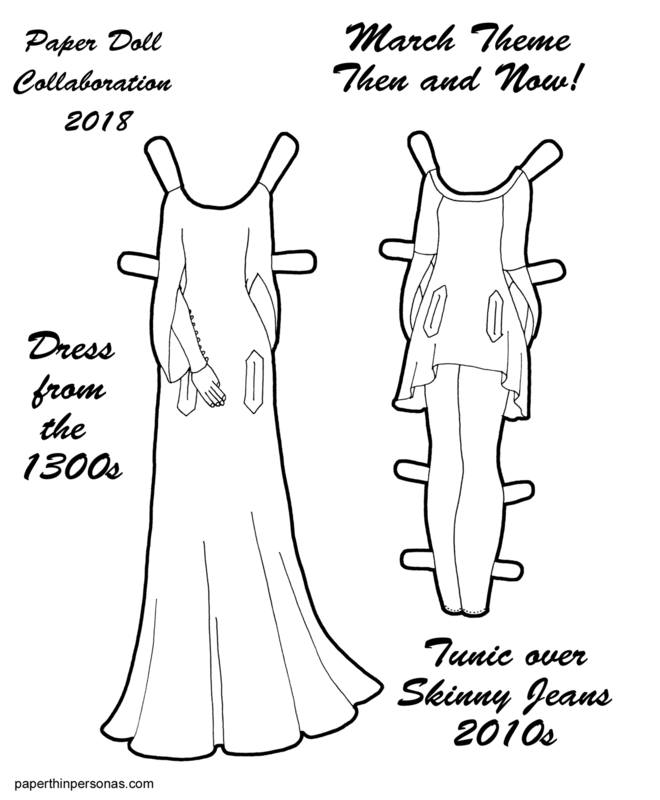 Black and White Paper Doll PDF Paper Doll Collaboration 2018The challenge for March to our little collaborative paper doll group was to create two paper doll outfits- one based on a historical period and one adapting that period dress to another time. I had all sorts of ideas in my head, but when I saw a tunic that really reminded me of the sleeves of the 1300s, I thought- perfect choice. So on the left is a gown of the 1300s. It consists of an surcoat over a kirtle or gown. The kirtle and the surcoat were often equally fitted. The surcoat in this case has a draped false sleeves and pockets. The slits in the surcoat would have allowed the wearer to access pockets beneath the surcoat. The tight sleeves of the kirtle below it are buttoned at the cuffs. Check out my 14th century fashion Pinterest board for images from this era. The tunic is based (sort of) on one I actually own. There is some debate about the construction of 14th century gowns. Some scholars have proposed that the low wide necklines depicted in manuscripts are created by a raglan sleeve construction technique. So I decided to make my tunic raglan sleeved with tulip style flared sleeves and a shark-bite hemline. The pockets I thought were a cute detail, though perhaps not terribly likely (or practical) on a modern garment. The idea for the theme came from Boots of Pop Culture and Paper Dolls. She’s paused on her paper doll creation for the moment, but her site is full of wonderful content and well worth a look. What a great interpretation! I love the tunic on the right and the influence is really clear.